When I do a wardrobe clear out, it usually happens on a Sunday. I dramatically pull everything out of every cupboard and spend the next four hours trying to manage the mess rather than using it as a chance to properly assess the gaps in my wardrobe. I decided to do this year's spring-clean a little differently. A while ago, an influencer showed me a folder on her phone where she stored pictures of her outfits from every single day. These weren't the glossy outfit pictures you see on your Instagram feeds, but quick snapshots purely designed to keep a record of her outfits. 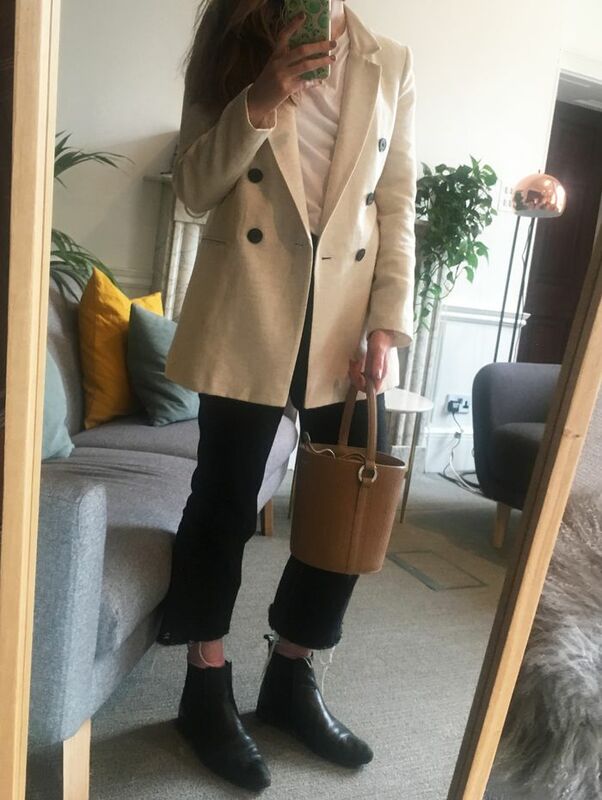 In 2018, my two aims were to spend less on Pret sandwiches and to try to vary my outfits every day (I am a big repeat wearer), so I decided to try her method for a week. Taking a picture of myself every day might sound like a pointless vanity project or an attempt to launch a career as an influencer. However, I made myself take a picture of my outfits to understand what I wear the most and feel comfortable in. When I got a Monzo card for the first time in my life, I knew exactly how much I was spending on toasties and black Americanos—as it breaks down what you spend each day by category. My outfit photo diary actually, much to my surprise, did a very similar thing. Day 1: River Island blazer; Topshop jeans; Christopher Kane Chelsea boots; Topman T-shirt; Meli Melo Bucket Bag (£395). Day 2: Mango Trench Coat (£150); Faithfull the Brand green floral dress; Sézane brown suede ankle boots; Meli Melo Bucket Bag (£395). I am not a natural-born selfie taker, and so the first challenge was to make myself start doing it at all. I have pushed back the deadline for this story three times because I told myself I didn't have the time to take a picture every day. I thought I'd have to wake up earlier (which would be another challenge altogether), be more on top of my laundry pile, wear more makeup and maybe even go shopping in preparation. Silly excuses for someone with a wardrobe with no space for anything extra. Day 3: Rixo blouse; Topshop jeans; Yuzefi bag. Day 4: Faithful the Brand green floral dress; Yuzefi bag; Converse trainers. I started the week by sharing these outfit pictures on Instagram, however, I quickly realised that I was focusing more on finding the right angle or which funny GIF to post with the outfit on my story, which wasn't the point. So for this to work, I needed to do what the influencer did and take candid snapshots of my outfits that were just for me to look at. This wasn't about creating outfits that would generate the most likes or reactions from other people—it's a trick that can help you to hone your own personal style. Knowing I had to take a picture did subtly impact what I wore each day, as it made me think about wearing a different jacket from the day before, say, or adding a slight variation to one of my favourite outfits. It was a helpful push to make me more aware of my personal style and what I feel the most confident in. Looking over my daily outfits, I can clearly see what makes up my own "capsule wardrobe". I wore 18 items that week, but the things that repeated the most are an oversized trench coat from Mango, a green floral wrap dress (which I wore twice that week), my black croc-effect Chelsea boots, a bucket bag and some small delicate shell earrings. You'll see one of these five items in every picture from the week. In my head, I wear floral midi dresses the most, however, my diary shows that jeans, a crew neck jumper and blazer are my actual fail-safe outfit. Day 5: Isabel Marant Blazer; J.Crew cashmere jumper; Arket Straight Leg Jeans (£55); Coach belt; Converse trainers. Day 6: River Island pink double-breasted blazer; Arket jumper; Topshop jeans; Sezane brown boots; Meli Melo bag. It might sound narcissistic, but I am going to continue to take these daily selfies. I found that you're able to do a more meaningful audit of your wardrobe by being slightly more aware of what you wear every day. While it's much cooler to pretend you simply "throw outfits together" and "never think about it," having a phone filled with outfit ideas with the items you actually own is the most useful inspiration you could have. Anyone ready to make this a part of your morning routine too?